Although GTX 770 is already a very high clocked part for GK104, we still wanted to put it through its paces when it comes to overclocking. Of particular interest here is actually memory overclocking, as this is the first video card shipping with 7GHz GDDR5 standard. This will let us poke at things to see just how far both the RAM itself and NVIDIA’s memory controller can go. Meanwhile the switch to GPU Boost 2.0 for GTX 770 is going to change the overclocking process somewhat compared to GTX 680 and GTX 670. Overvolting introduces marginally higher voltages and boost bins to play with, while on the other hand the removal of power targets in favor of TDP means that we only get 106% – an extra 14W – to play with in TDP limited scenarios. 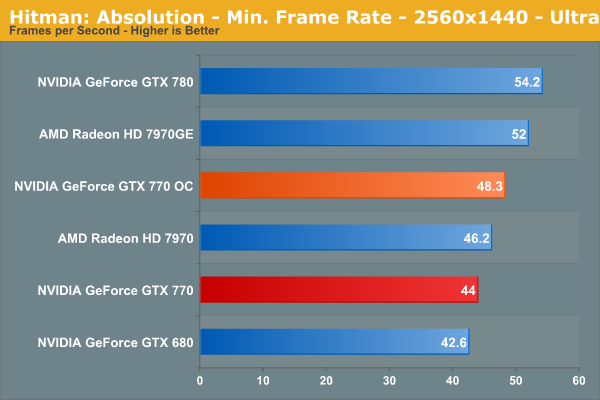 Thankfully as we’ve seen we’re generally not TDP limited on GTX 770 at stock, which means our effective headroom should be greater than that. We’re actually a bit surprised we were able to get another 100MHz out of the GPU itself. Even without the extra overvoltage boost bin, we’re still pushing 1200MHz+ on 1.2v, which is doing rather well for GK104. 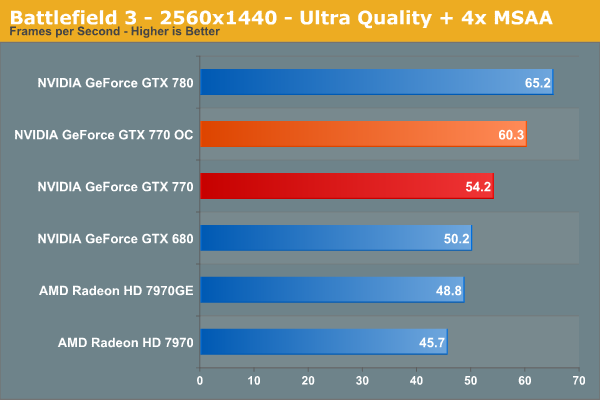 Of course this is only a 9% increase in the GPU clockspeed, which is going to pale in comparison to parts like GTX 670 and GTX 780, each of which can do 20%+ due to their lower clockspeeds. 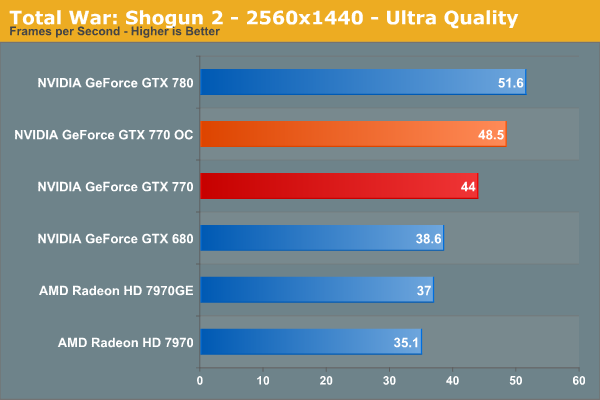 So there’s some overclocking headroom in GTX 770, but as to be expected it's not a lot. More interesting however is the memory overclock. We’ve been able to put another 1GHz on 6GHz GTX 680 cards in the past, and with the 7GHz base GTX 770 we’ve been able to pull off a similar overclock, pushing our GTX 770 to an 8GHz memory clock. The fact that NVIDIA’s memory controller can pull this off is nothing short of impressive; we had expected there to be some headroom, but another 14% is beyond our expectations. At this clockspeed the GTX 770 has a full 256GB/sec of memory bandwidth, 33% more than both a stock GTX 680 and the 384-bit GTX 580. Of course we’ll see if GTX 770 can put that bandwidth to good use. The end result of our overclocking efforts nets a very consistent 9%-12% increase in performance across our games. 9% is the upper bound for improvements due to GPU overclocking, so anything past that means we’re also benefitting from the extra memory bandwidth. We aren’t picking up a ton of performance from memory bandwidth as far as we can tell, but it does pay off and is worth pursuing, even with the GTX 770’s base memory clock of 7GHz. 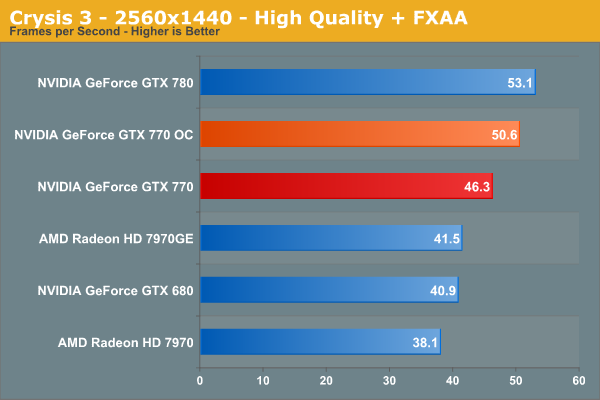 Overall overclocking can help close the gap between the GTX 770 and 7970GE in some games, and extend it in others. 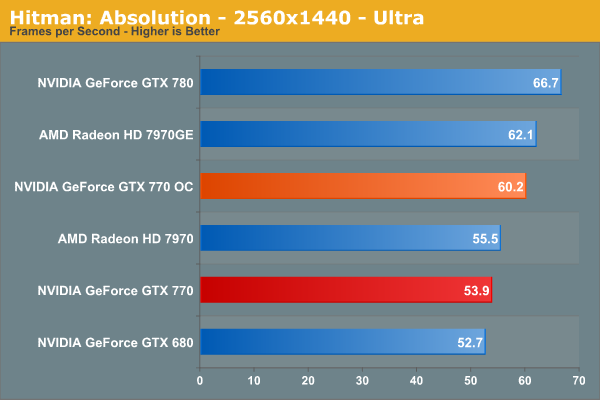 But 10% won’t completely close the gap on the GTX 780; at best it can halve it. GTX 780’s stock performance is simply not attainable without the much more powerful GK110 GPU. Moving on to power consumption, we can see that the 106% TDP limit keeps power usage from jumping up by too much. In Battlefield 3 this is a further 12W at the wall, and 21W at the wall with FurMark. 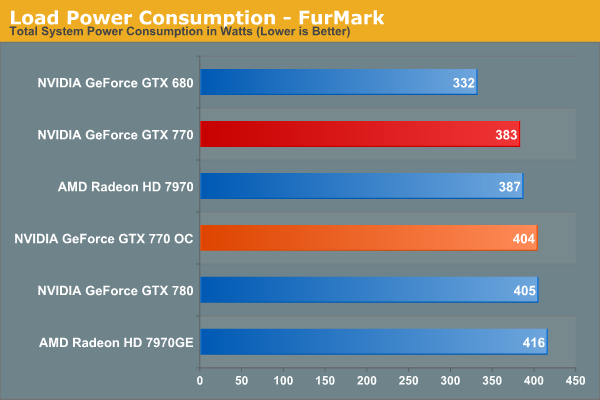 In games this means our power usage at the wall is still below GTX 780, though we’ve equaled it under FurMark. 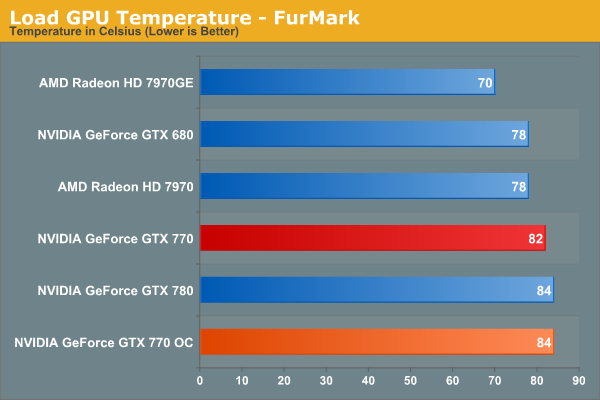 The fan curve for GTX 770 appears to be identical to that of GTX 780. 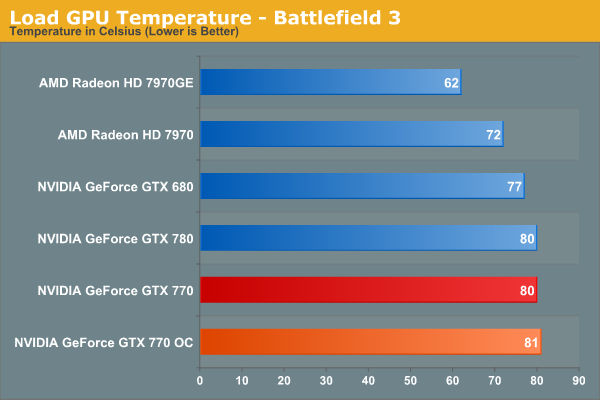 Which is to say the fan significantly ramps up around 84C, keeping temperatures in the low-to-mid 80s even though GPU Boost 2.0 is allowed to go up to 95C. 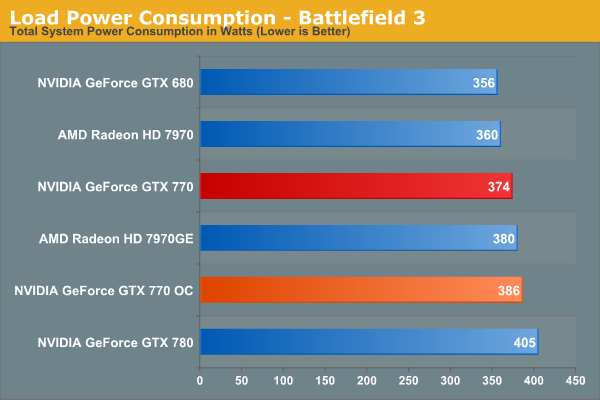 Finally for fan noise, we see a small increase under Battlefield 3, and no change under FurMark. 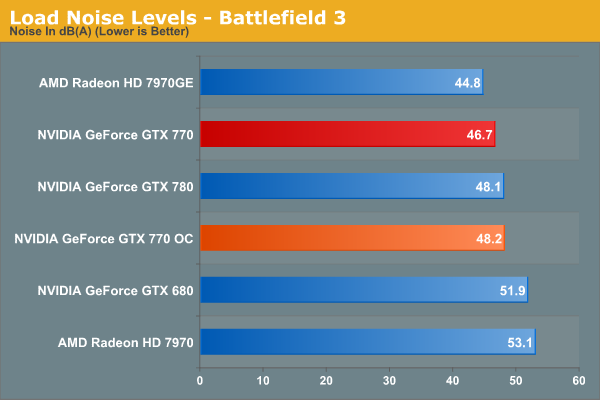 1.5dB louder under Battlefield 3 puts noise levels on par with the GTX 780, sacrificing some of GTX 770’s abnormally quiet acoustics, but still keeping noise below the 50dB level. 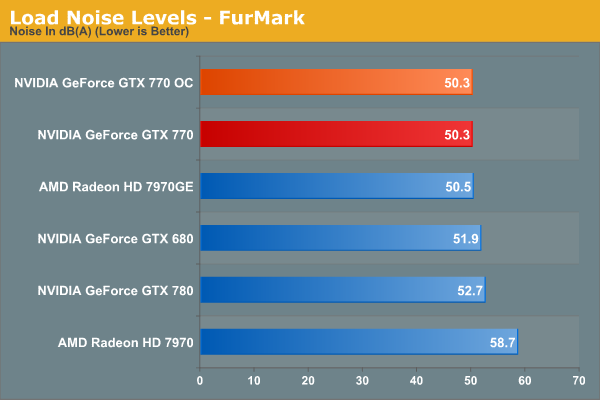 Or to put this another way, the performance gains for overclocking aren’t particularly high, but then again neither is the cost of overclocking in terms of noise.